Blend the chopped fresh tomatoes with some water to obtain a paste. Finely chop the onion and garlic. In a skillet over medium heat, sauté the onion and garlic in olive oil. If using grated carrot, add it to the skillet and stir for few minutes more. 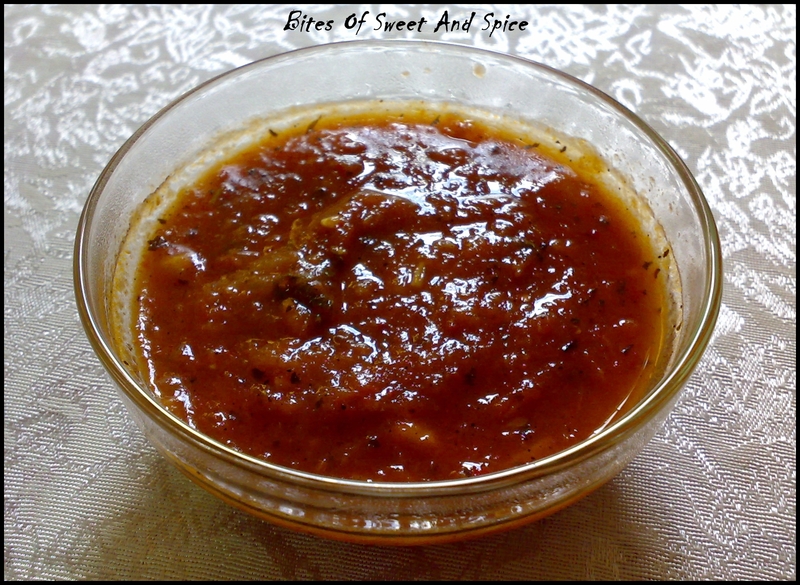 Add the tomato puree, blended tomato paste to the pan along with the remaining ingredients. Add some water if needed and let the sauce simmer for about 10 minutes or till thickened to the desired consistency, stirring occasionally. Adjust the salt, pepper and herbs according to your taste. If you like your sauce to be smooth, blend it once cooled. The sauce can be prepared beforehand and stored in the fridge. Boil your spaghetti (or pasta of your choice) in salted water until “al dente”. 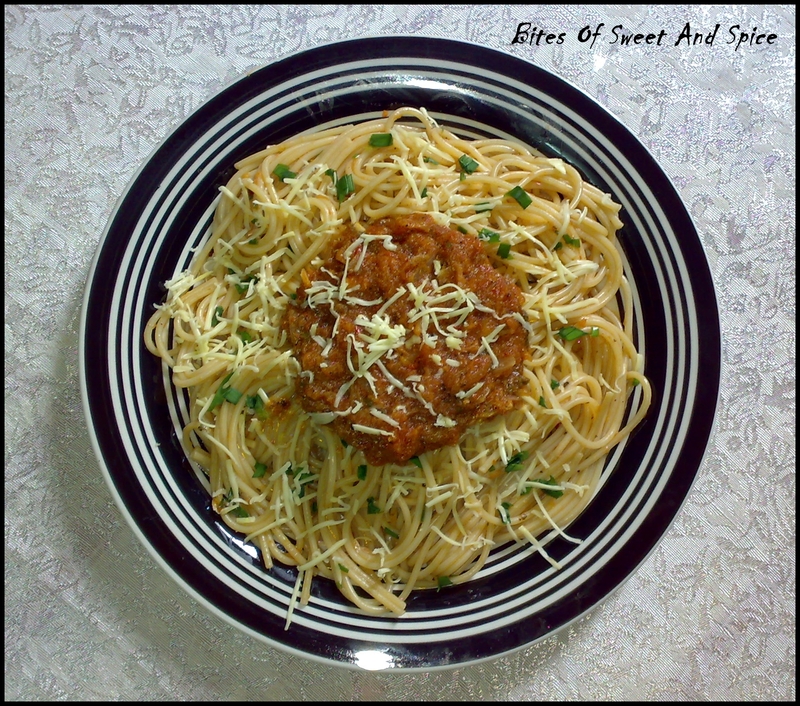 Keep some of the marinara sauce (about 2/3) aside and add the cooked spaghetti to the pan. Toss till well coated and place on the serving plate. 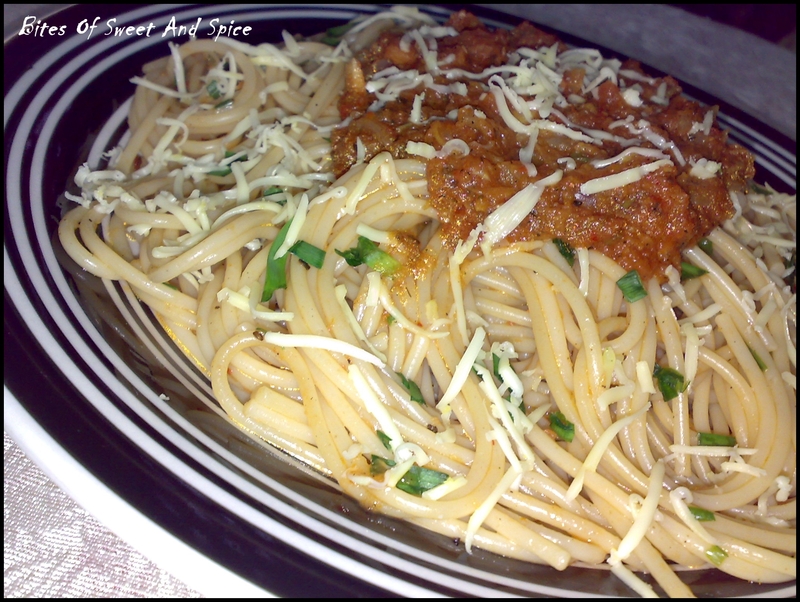 Top with the Marinara sauce and grated cheese. Serve warm! I usually like to mix in my spaghetti with all the sauce and top it with lots of cheese. 🙂 Yummy!! Bon appetit! 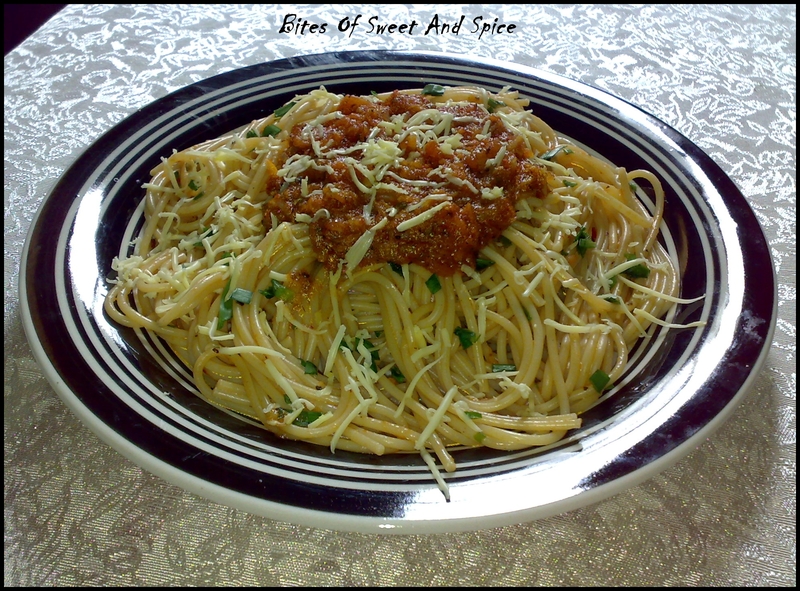 This entry was posted in Main dishes, Pasta, Sauces, Dips and Condiments, Vegetarian and tagged From scratch, Italian, Marinara sauce, Spaghetti, Tomatoes. Bookmark the permalink. One of my favourite meals! This looks yummy, great job! Thank you! 🙂 I love Italian food! Glad to hear the island didn’t get a class 3 warning. Think that happened 3 years back when we were there. Helloooo. I’ve just found your blog for the first time! YUM YUM! I can smell those onions and taste those tangy tomatoes already. Now I know what I’m having for dinner. Mmmmm. Hi!! 🙂 I’m glad you found my blog!.. I bet you had a great dinner. 🙂 Keep stopping by! hey poonam! tone aret blog?? Hi Prerrna! I’ve been away from my blog for quite long! Impe lack of time and mostly paresse.. but mo pan abandon it.. 🙂 Trying to come back to it now..